Ultrasonic level meter that can measure interfaces. 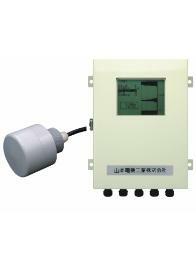 Non contact level meter that can detect a liquid interface in a sediment tank. Install a sensor oscillator in water to measure. There are no driving component and so it will provide stable measurements for a long time. Washing nozzle and installation pipe are equipped as standard. There is no danger of having the sensor being caught by a rake, as it is mounted separately and measures the interface without contact. There are no driving component in the converter and sensor so it will provide stable measurements for a long time. A washing nozzle (for water washing) and installation pipe are equipped on the sensor as standard. * The nominal measuring distance is determined by the static water level used as a reflecting mirror. It may become shorter with various measuring conditions. * The actual measuring range is determined by each measuring condition.For details, contact to our staff.